A Scotland Yard inspector has been found stuffed in a black steamer trunk at Euston Square Station, his eyes and mouth sewn shut. When Walter Day, the squad’s new hire, is assigned to the case, he finds a strange ally in Dr. Bernard Kingsley, the Yard’s first forensic pathologist. Their grim conclusion: This was not just a random, bizarre murder. It appears that the police – possibly the squad itself – are being targeted, and the devious killer shows no sign of stopping before completing his grim duty. But Inspector Day has one more surprise, something even more shocking than the crimes: the killer’s motive. Review: I don’t read a lot of historical fiction, but I usually enjoy historical fiction when it is wrapped up with a mystery. I’m so glad that I did finally get around to this book because I really did enjoy it. My one main criticism would be that we really knew who the killer was entirely too early. It was still interesting to watch the case unfold, but I’m just not a fan of knowing who the killer is so early in the book. I can’t tell you how atmospheric this book felt to me. I really felt like I was walking the streets in London in the 1800s, I felt like Mr. Grecian really captured the feel of the city during that time period. So overall I’m thrilled that I read this book and it gives me a new series to follow (like I needed that!!) But yes, I would definitely recommend this book to both historical fiction lovers and mystery lovers. I felt like it was a perfect blend of the two genres and I thoroughly enjoyed it. Blurb: When Emily Pollifax answered the phone that Sunday morning she quickly forgot about her Garden Club tea in the afternoon. The last time she had heard the voice on the other end of the line it had sent her off on a journey that plunged her into a wild tangle of secret agents and high adventure – an exciting change from her quiet life in the New Jersey suburbs. Now the man from the CIA was asking if she could leave immediately on a mission that would take her half-way across the world. What else could Mrs. Pollifax say but yes?? Review: Ok, so I had read the first Mrs. Pollifax book, The Unexpected Mrs. Pollifax back in 2016 and wasn’t really all that thrilled with it. But when I saw this one on the shelf at my favorite used bookstore I figured for $1 it wouldn’t kill me to give it another shot. I’m glad I picked this one up that day. I thought this installment was much better than the first. I felt like I got to understand Mrs. Pollifax better. I felt like there was more meat to the story itself and I enjoyed it quite a bit. I really enjoyed the supporting characters in this installment, they really added to the story in a positive way. I’ll definitely be on the hunt for book #3 in this series. I’m definitely glad I gave Mrs. Pollifax another shot! A literary suspense novel in which an eerie social game goes viral and spins perilously—and criminally—out of control. Rebecca’s on-again, off-again boyfriend, Ezra, has gone missing, but when she notifies the police, they seem surprisingly unconcerned. They suspect he has been playing the “stranger game,” a viral hit in which players start following others in real life, as they might otherwise do on social media. As the game spreads, however, the rules begin to change, play grows more intense and disappearances are reported across the country. Curious about this popular new obsession, and hoping that she might be able to track down Ezra, Rebecca tries the game for herself. She also meets Carey, who is willing to take the game further than she imagined possible. As her relationship with Carey and involvement in the game deepen, she begins to uncover an unsettling subculture that has infiltrated the world around her. In playing the stranger game, what may lead her closer to finding Ezra may take her further and further from the life she once lived. A thought-provoking, haunting novel, The Stranger Game unearths the connections, both imagined and real, that we build with the people around us in the physical and digital world, and where the boundaries blur between them. When I was first pitched this book that blurb immediately drew me in. I had to know more about what the Stranger Game was and how things would end up playing out! And whoa, let me tell you, this book starts out with a super creepy vibe and I was immediately hooked! I was expecting a fast paced thriller, but I was pleasantly surprised by a more slower paced, layer by layer unfolding book that really left me with chills when I was finished! I found this book to be extremely readable and there were lots of twists and turns to make this one a really good read. Peter Gadol’s seven novels include THE STRANGER GAME, SILVER LAKE, LIGHT AT DUSK, and THE LONG RAIN. His work his been translated for foreign editions and appeared in literary journals, including StoryQuarterly, the Los Angeles Review of Books Quarterly Journal, and Tin House. 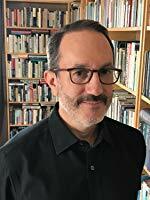 Gadol lives in Los Angeles, where he is Chair and Professor of the MFA Writing program at Otis College of Art and Design. Visit petergadol.com for more info on his work. Review: This is the 7th book in the Kinsey Millhone series. I had read the 6th book a few months back and thoroughly enjoyed it, so I was excited when this fit a Goodreads challenge call-out so I could get to it sooner rather than later! Again, I enjoyed working the case with Kinsey. It was interesting to see just what kind of trouble she finds herself (usually because she puts herself there…). I also enjoyed the addition of Robert Dietz, I hope we get to meet him again in future installments. I found this one to be a fast paced and enjoyable book that I really enjoyed reading. It definitely has me looking forward to “H” soon! Blurb: When Mitch McDeere signed on with Bendini, Lambert & Locke of Memphis, he thought he and his beautiful wife, Abby, were on their way. The firm leased him a BMW, paid off his school loans, arranged a mortgage, and hired him a decorator. Mitch McDeere should have remembered what his brother Ray – doing fifteen years in a Tennessee jail – already knew. You never get nothing for nothing. Now the FBI has the lowdown on Mitch’s firm and needs his help. Mitch is caught between a rock and a hard place, with no choice – if he wants to live. Review: So I’m going back and (slowly) reading Mr. Grisham’s backlist. I can’t believe I had never read this book before! It started out really good and hooked me from pretty early on. Don’t be daunted by that 500 page count … it goes by very quickly! The old saying goes … if it’s too good to be true, it probably is. And that’s basically the premise of this book. I still can’t believe that a man who was as smart as Mitch McDeere could fall for all that and get involved with the Bendini firm – he should have run like crazy when all this stuff was told would be “provided” to him! But then we wouldn’t have a novel and where would the fun in that be? I did enjoy how the story unfolded and I really didn’t know how things would end up. I was pleasantly surprised and quite happy with the way the book ended. Now I’m eager to see the movie … hadn’t read the book and never saw the movie! I always enjoy doing a book to movie comparison. I hope to be able to get to that soon … I’ve already seen where I can rent it on my Amazon Prime account (hey, I’m still really new to all this streaming stuff, haha!). Overall, a very good book that I thoroughly enjoyed. Definitely recommended! Blurb: When Kinsey Millhone first arrives in Floral Beach, California, it’s hard for her to picture the idyllic coastal town as the setting of a brutal murder. Seventeen years ago, the body of Jean Timberlake – a troubled teen who had a reputation with the boys – was found on the beach. Her boyfriend, Bailey Fowler, was convicted of her murder and imprisoned, but he escaped. After all this time, Bailey’s finally been captured. Believing in his son’s innocence, Bailey’s father wants Kinsey to find Jean’s real killer. But most of the residents in this tight-knit community are convinced Bailey strangled Jean. So why are they so reluctant to answer Kinsey’s questions? If there’s one thing Kinsey’s got plenty of it’s persistence. And that’s exactly what it’s going to take to crack the lid on this case. Review: It’s been forever since I visited with Kinsey Millhone and so I was glad when this book popped up on my April call-out on a Goodreads challenge. I had a lot of fun working the case with Kinsey. It definitely ended up going in a direction that I never saw coming, although there was a couple small instances that should have clued me in had I been paying more attention. Jumping back in with Kinsey definitely made me want to read more of her and soon! I don’t remember her being so badass, but I definitely enjoyed it! She’s smart and strong, a good (and sometimes rare) combination in female protagonists. I definitely appreciate that aspect of her character. If love is what injures us, how can we heal? I’m seriously bummed that Ms. Grafton passed away a little while ago. I’m disappointed that the alphabet now ends with Y … but I am satisfied with the decision to not use a ghost writer to finish the series out (I hate, hate, HATE when that occurs.) I’m looking forward to getting around to G sooner rather than later!! Blurb: Desperate to escape her kidnappers, Kody Cameron can turn to only one man…and he’s holding a gun. Outnumbered and trapped in the deadly Everglades, she has little recourse, but something in this captor’s eyes makes her believe she can trust him. Does she dare to take the risk? Undercover agent Nick Connolly has met Kody before and knows she might very well blow his cover. Though determined to maintain his facade, he can’t let Kody die. He won’t. And his decision to change his own rules of law and order are about to make all hell break loose. Review: This was the June selection on Barnes & Noble’s Serial Reads. Having enjoyed the last two months’ selections, I was eager to see what would be on the agenda for June. This one didn’t really do much for me. I don’t read a lot of romance to begin with. So I was a little leery to give this one a go, but I figured it was free so why not. (Plus I unexpectedly enjoyed Beastly last month.) It left me with a definite “eh” feeling. I think a lot of my problem was that I found Kody’s character to be pretty foolish. I also felt like the storyline was rushed. I’ve never read anything by Heather Graham before and I have a really bad feeling that this was not necessarily a good place for me to start. But I finished it and while it didn’t really appeal all that much to me, I’m sure romance readers will enjoy it. Blurb: Sussex, England. A middle-aged man returns to his childhood home to attend a funeral. Although the house he lived in is long gone, he is drawn to the farm at the end of the road, where, when he was seven, he encountered a most remarkable girl, Lettie Hempstock, and her mother and grandmother. He hasn’t thought of Lettie in decades, and yet as he sits by the pond (a pond that she’d claimed was an ocean) behind the ramshackle old farmhouse, the unremembered past comes flooding back. And it is a past too strange, too frightening, too dangerous to have happened to anyone, let alone a small boy. Forty years earlier, a man committed suicide in a stolen car at this farm at the end of the road. Like a fuse on a firework, his death lit a touchpaper and resonated in unimaginable ways. The darkness was unleashed, something scary and thoroughly incomprehensible to a little boy. And Lettie – magical, comforting, wise beyond her years – promised to protect him, no matter what. A groundbreaking work from a master, The Ocean at the End of the Lane is told with a rare understanding of all that makes us human, and shows the power of stories to reveal and shelter us from the darkness inside and out. It is a stirring, terrifying, and elegiac fable as delicate as a butterfly’s wing and as menacing as a knife in the dark. Review: I picked this one up a couple of years ago at the library book sale. I had heard a lot of good things about Neil Gaiman and was curious. I picked this one up now because I needed something quick to read, and at 178 pages I figured this one would fit that bill perfectly. And it was a quick, easy read. I just didn’t care for the overall storyline. I am not a huge fan of fantasy as a general rule, so I think that affected my overall feelings on this one. It just didn’t work for me personally, but Mr. Gaiman is definitely a gifted storyteller. Blurb: Mrs. Virgil (Emily) Pollifax of New Brunswick, New Jersey, was a widow with grown children. She was tired of attending her Garden Club meetings. She wanted to do something good for her country. So, naturally, she became a CIA agent. This time, the assignment sounds as tasty as a taco. A quick trip to Mexico City is on her agenda. Unfortunately, something goes wrong, and our dear Mrs. Pollifax finds herself embroiled in quite a hot Cold War–and her country’s enemies find themselves entangled with one unbelievably feisty lady. Review: I requested this one from Paperbackswap after seeing Stacy mention the second in the series on Goodreads. It was definitely an impulse “purchase” but it sounded like such a fun, cute book. And for the most part, it was. It should have been a quick, easy read. 192 pages – I could knock that out relatively quickly. But for some reason, it didn’t really click with me. I enjoyed the first bit of the book quite a bit, where Mrs. Pollifax introduces herself to the CIA and when she first went to Mexico City. It was all the stuff that came after that I didn’t care for. It just seemed to drag on forever with very little movement toward anything. So while I wouldn’t say this book is bad, I doubt I continue on with this series. I need more meat to my stories. I need to connect more to the characters (and I really couldn’t find myself connecting to Mrs. Pollifax very well). So yeah, not terrible but not something I’ll remember in a month.